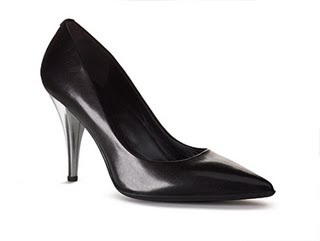 Road Tested: The Kenneth Cole 925 Silver "Belle" Pump | Fashion. Style. Beauty. | Life is short. Live well. Remember I wrote about the launch of the Kenneth Cole 925 Silver Collection, the new line of shoes that the designer spent four years creating that are supposed to revolutionize comfort? Well, just for you, FSB readers, I decided to put a pair of the shoes through the ultimate road test: Mercedes-Benz Fashion Week. I figured if these shoes can handle running across stone and concrete, up and down flights of stairs, and last into the evening for cocktails with 7″ heel-mad fashion fanatics, they would get my vote. So I got a pair and wore them. The first thing you notice when picking the shoe up is that it’s more dense than other shoes. There’s a lot of construction that goes into this it and it’s evident from the minute you pick it up. Slide your fingers into it and you’ll notice an incredibly soft interior and layers that not only protect the bottom of the foot but the entire area around the foot as well, including the top of the toes. This shoe is built to prevent chaffing and blisters and once you slide your foot inside, you’ll feel the difference. I was pleasantly surprised. After 14 hours and three days in this shoe, the verdict is in: it does exactly what it says it does, which is protect your foot from blisters and hard wear-and-tear damage. Per my experience, you have to break the shoe in like any other but the difference with the Kenneth Cole 925 technology is that not only does it break in faster (a matter of a couple of hours rather than days or weeks), but it molds to conform to your foot. My 925 Silver “Belle” pumps are now customized for my foot and I love them. Which means you can’t borrow them…ever. After multiple wears, I can report that they’re amazingly comfortable! I guess you could run a marathon in them to really prove it but why test hitting a pothole? Really, take my word for it: get yourself a pair of these shoes. I want the ankle boot and I need a tall boot when it comes out! I’m hooked! Hi can you tell me if the heel itself is actually metal, or is it a silver coating that can chip off?